The national SMS 800 database (now known as Somos) provides 877 toll free number prefixes to phone companies who provide toll free service to small businesses. Small business owners can secure an 877 toll free number and use it as their main business phone number the same way they would use a traditional 1-800 number. 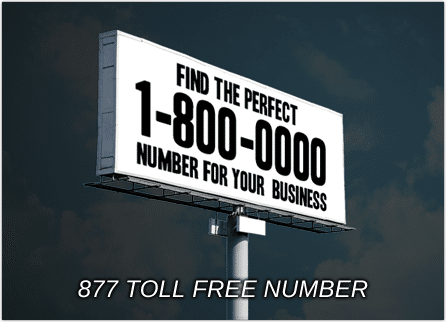 Additionally, custom 877 toll free numbers (or vanity numbers) are available to businesses wishing to use a number that spells their business name or term related to their industry. 1. They’re toll free numbers. 877 toll free numbers work just like other toll free numbers with different prefixes (800, 888, 866, 855, 844, & 833). They are regulated by the FCC and provisioned by the national toll free number directory Somos, in the same way as other toll free numbers. They provide you with number portability allowing you to transfer your number from one phone company to another. An 877 area code gives your business a nationwide presence. And a memorable vanity 877 number can boost your marketing and help customers remember to call your business (like 877-FLOWERS). 2. They give your business credibility and a nationwide presence. Although not as popular as toll free 800 numbers, 877 numbers are an excellent alternative to an 800 toll free number prefix. An 877 number provides your company with the same credibility and national presence as other toll free numbers. Also, 877 toll free numbers are portable meaning you own your business number and can transfer it from toll free service provider to toll free service provider. 3. UniTel Voice has you covered. You can purchase your very own 877 number from UniTel Voice for a low monthly rate – no setup fees or long-term contracts.